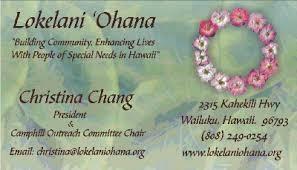 This week on Helping Hand we’re learning about Lokelani 'Ohana, whose mission is to create socially therapeutic programs for adults with developmental disabilities. Listeners may recall when legendary entertainer Kris Kristofferson was on ATC, promoting a benefit concert he was doing for them. HPR ATC Host Dave Lawrence speaks with Lokelani ‘Ohana President Christina Chang. Helping Hand is a weekly feature airing on HPR1 stations each week during the afternoon drive statewide broadcast of All Things Considered, and then appearing online here. Every Friday afternoon, Helping Hand puts the spotlight on an organization or event in the community that offers assistance to the disabled and others among the most vulnerable. Find all the Helping Hand segments here.